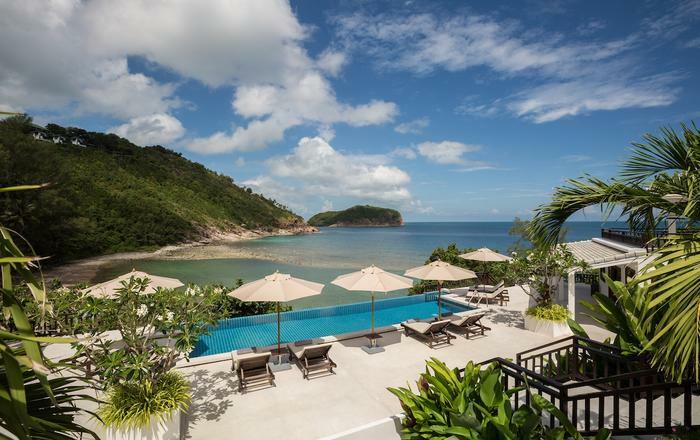 Baan Lealay is an exceptional 4 bedroom villa beautifully located in the Bophut hillside affording spectacular views of the north shores of Koh Samui. From its elevated position your first glimpse of the jaw-dropping views will greet you as you make your way through the private gates into a courtyard parking area. 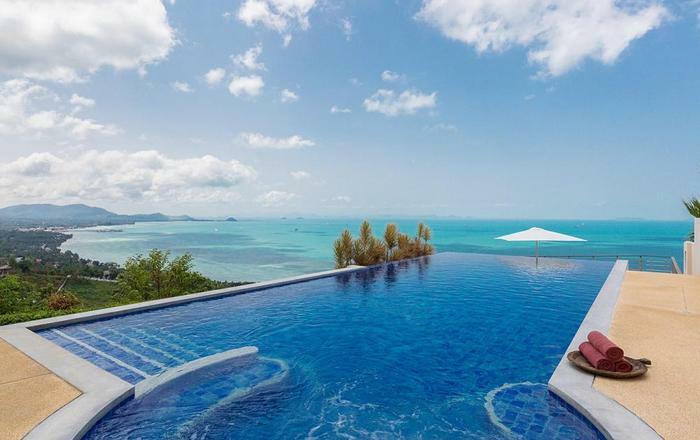 Here Samui's blue skies, the villa's white walls and grey slate roof tiles combine with the vibrant colours of the potted bougainvillea trees and the glistening ocean in the distance to paint a picture perfect image of style and nature blending in harmony. 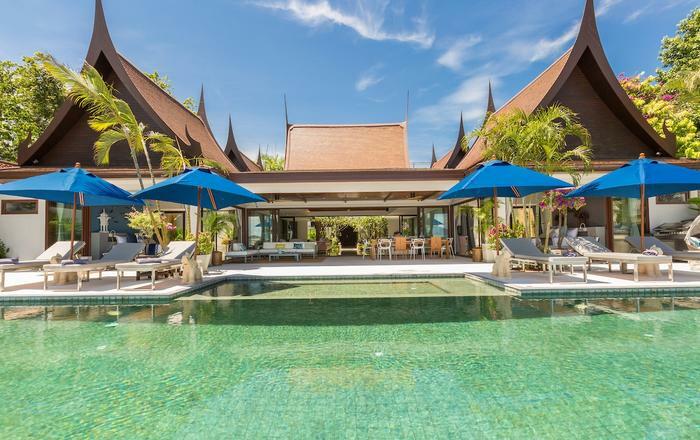 A traditional Thai spirit house brings the ancient and the modern together at the entrance of this incredible villa where the east and west collide. From the parking terrace stonewashed steps lead down to the first level of the villa that comprises of three bedrooms a flanked by a spacious balcony that offers panoramic ocean views. Each bedroom offers luxury, comfort and uninterrupted views of the island and ocean beyond. Tastefully decorated and with artifacts from around the country, luxurious linens, ample storage and modern conveniences such as flat panel TV's and satellite connections the bedrooms are a haven of tranquility where your every need has been catered for. The twin room on this level has two comfortable beds and an en-suite shower room. The double bedroom to the west side of the building has a standalone bed that is perfectly positioned for you to soak up the views before your rise. Double patio doors leading onto the balcony, a spacious ensuite bathroom with his and hers sinks, a shower and a luxurious terrazzo bath tub thoughtfully placed so those views can be enjoyed even when you are bathing complete this oasis. The double glazed balcony doors to the right of this room offer views of the pool and the pool terrace. The third bedroom on the east side of this level offers an almost self contained living space. Patio doors from the balcony open onto a beautifully appointed suite with an enormous double bed and a chaise lounge. To the right of the room you will find a comfortable lounge area with two relaxing chairs, a coffee table and a flat panel TV beyond which you will find a large en-suite bathroom with his and hers sinks, an ocean view terrazzo bath tub, WC and shower as well as a spacious dressing room with more than ample storage space. Back to the main entrance you will find an spacious hall way with two sets of steps, one leading down to the pool terrace and one leading the staff quarters, gym and the steam and sauna room. The large pool terrace has more of those uninterrupted views. The infinity pool is the perfect place to cool off and marvel at the ocean and jungles beyond from this deliciously elevated position. 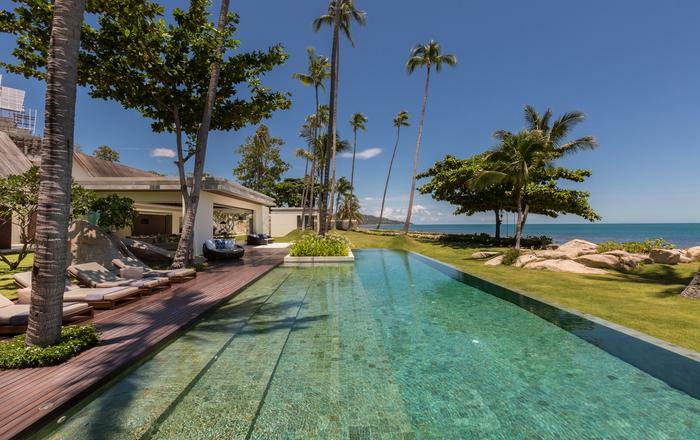 To the right of the pool is a comfortable sala that offers a shady spot to enjoy a cooling cocktail or an in villa massage. Here you will also find a large BBQ for some fabulous al-fresco dining. The well appointed, modern western kitchen on this level has a large refrigerator, built in electric oven, microwave oven, gas hob and spacious granite work surfaces and a breakfast bar. Beyond the kitchen is a convenient guest W/C. The spacious open plan living area also benefits from the amazing views and has large, sumptuous sofas, a dining table that can comfortably accommodate eight diners, a large flat panel TV and beautifully chosen arts and artifacts. The double bedroom to the west of this level is identical to the one above with a standalone double bed, ample storage and a beautiful en-suite bathroom with twin sinks and ocean view terrazzo bath tub. The central staircase connects with the rear staircase on the second level and descends to the third level. On this level you will find the steam room and the sauna that have more of those unforgettable views. From here a further staircase drops down to the fourth level where you will find a well appointed, modern, air-conditioned gymnasium, that unsurprisingly also benefits from the ocean views. The layout of this beautifully designed villa makes it a superb choice for families as well as friends and couples sharing. The accommodation offers both privacy and sociable areas that encapsulate the very essence of indoor/outdoor living. 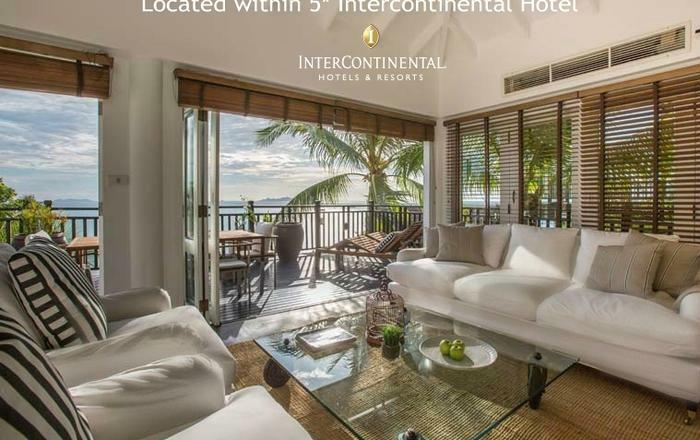 Cleverly incorporated into the hillside Baan Lealay has been designed so that every room showcases the views and the beauty that is the north shore of this incredible tropical island. The villas location puts it within easy reach of the romantic Fisherman's Village with its ocean front restaurants, bars and boutique style shops. Thank you for a lovely time in this beautiful villa. 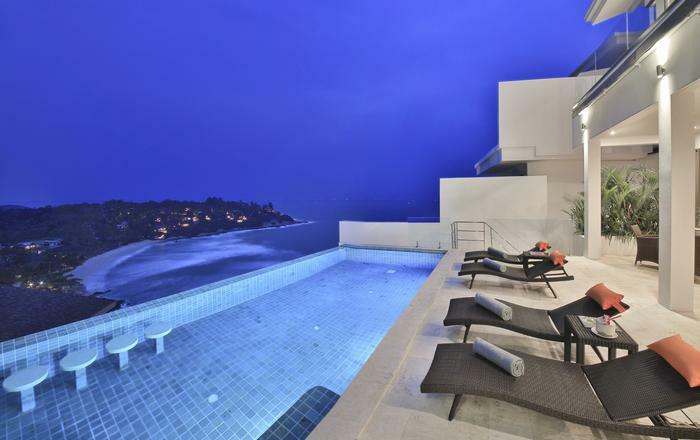 The villa and the view is fantastic! Beer and Pla made us feel like royalty. Beer's cooking is amazing. We had a fantastic stay! This place is an amazing retreat. We has some wonderful weeks here and the pool was enjoyed every single day! Beer and Pla spoiled us with their lovely food and the kids were shining whenever they walked into the room. Fun times! Thank you! Airport transfers are free of charge as all the guests arrive and depart on the same flights. If guests arrive or depart at different times the additional charges will apply.